The wooden staves that are used to roll the Torah scroll (old testament scroll) from one section of the readings to another are often decorated either with Rimonim (two ornate silver finials) or a Keter Torah (Torah crown). These decorations are removed prior to reading from the Torah. 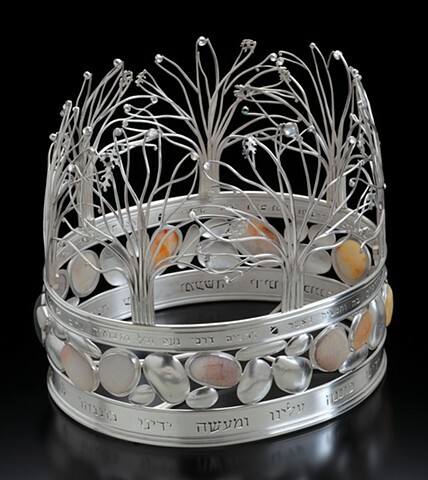 This Torah crown was commissioned by Rabbi Daniel Fink in the memory of his father, Rabbi Arnold Fink z”l, for Congregation Ahavath Beth Israel in Boise, Idaho. The numbers 7, 18, and 36 are repeatedly used in the many parts that make up this Keter Torah. These numbers have several significant meanings within Judaism, for example, seven is the day of the Sabbath and 18 in Hebrew is “chai” the word for life. Seven Oak Trees ring the top of the Keter Torah. The oak trees reflect the woods behind Rabbi Fink’s childhood home, where he and his father would often walk. There are 18 oak leaves, 18 acorns, and 18-3mm moonstones, 18-4mm moonstones, and 7 larger moonstones. One ruby and one emerald sit in the trees represent life – both flora and fauna. Twelve river rocks collected from the creek, Turkeycock Run, which runs through the same forest in Alexandria, Virginia, where Rabbi Fink walked with his father. Twenty-three silver river rocks, and one river rock from Boise, Idaho, for a total of 36 river rocks, flow in between the two bands. One opal sits among the river rocks. The top band has Proverbs 3:18, Etz Chaim – Tree of Life, pierced into it. The bottom band has Rabbi Arnold Fink’s (z”l) favorite psalm - Psalm 90 pierced into it: "The work of our hands—establish it, O God. Yea, the work of our hands, may You establish it."